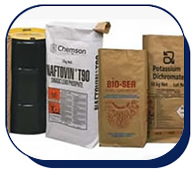 Kraft sacks perevent chemical substances in powder and granule form to absorb moisture and allow those substances to be carried safely with their leak proof features. Every type warning signs, information are presented in an evident manner with printing facilities. If requested, may be directly added, without pouring, to chemical mixtures with water soluble kraft paper and since it dissolves, no problems are encountered. and for similar products, 4 kg, 5 kg, 10 kg, 20 kg, 25 kg, 30 kg, 50 kg valve hexagonal bottom and open mouth (sewn, sewn gusseted ) sacks are recommended.